US, 1983, 104 minutes, Colour. Tony Roberts, Tess Harper, Robert Joy, Candy Clark, John Beal, Leora Dana, John Harkins, Lori Loughlin, Meg Ryan. Amityville 3D is a sequel to the 1979 success horror film, The Amityville Horror. This film was made for TV exhibition – and a number of the scenes are contrived to get the 3D effect with objects flying at the audience. It was directed by Richard Fleischer, veteran director of many genre films ranging from The Narrow Margin to Twenty Thousand Leagues Under the Sea, to The Vikings to Compulsion. The film opens promisingly with an expose of people holding séances. However, there is danger in the house which had served as the gate to Hell in the original film. The first victim is the estate agent, the sceptical journalist moves in with his family and there is death and destruction for most. There are dream sequences, special effects for the possessive demon. Tony Roberts is the journalist, Candy Clark has a good role as his assistant exposing the confidence tricks. Tess Harper is the journalist’s ex-wife and Robert Joy is the paranormal expert. There are early appearances from Lori Loughlin and, surprisingly for many, Meg Ryan. There were a further five sequels of The Amityville Horror and a remake of the original in 2005. 1.The popularity of The Amityville Horror? Plausibility? The original allegedly based on a true story? The exploitation of the story in the sequels? How successfully in this sequel? 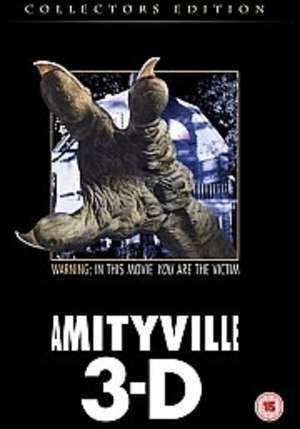 2.Amityville, the surroundings, the house, the interiors? The 3D effect? The production design for three-dimensional viewing? Musical score and atmosphere? 3.The Amityville house as the gate of Hell, the well, the demons? The special effects for the demonic activity? The flies? The lake? The fish? The monster? 4.John and Melanie and their going to the Caswells, the séance, the effects of the séance? Melanie as convincing? The sudden expose, the photos? The expert? The DA? The anger of the Caswells? 5.Clifford Sanders, the estate agent, his reaction to the expose? His going into the basement, falling down the hole, rescued? Melanie and the photos? The appearance of the flies and the distortion? His return to the house, attacked by the flies, his death? 6.John Baxter, interest in the house, Sanders and his offer? The discussions with Susan? The discussions with Nancy? The divorce? Wariness about the house? Susan and Lisa going to visit it? The scepticism by John? The photos? The death of Sanders? 7.Melanie, her participation in the expose, the photos? The aftermath, her wariness about the house, Sanders falling down the well? The photos and the distortions? Her fears, the car, almost killed in the crash? Her work, death? 8.Nancy, wary, not wanting her daughter to go to the house? The build-up to the final confrontation? John and his daughter, her death? The confrontation with the demon? 9.Susan, her age, love for her father? The house? Friendship with Lisa, the tour? The friends, the séance? The destructiveness of the house for her? 10.Elliot West, his researches? Consulted by Nancy? Friendship with John and Melanie? The set-up for the confrontation? The rescue? 11.The popularity of this kind of combination of haunted house story with the demonic?